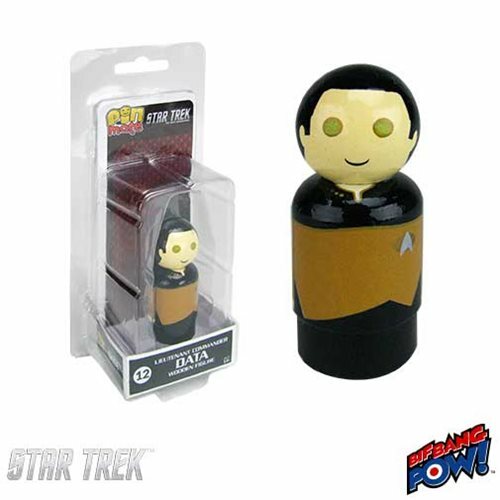 I'm taking a few minutes this morning to write a post inspired by a Twitter convo yesterday with Yang Fan. 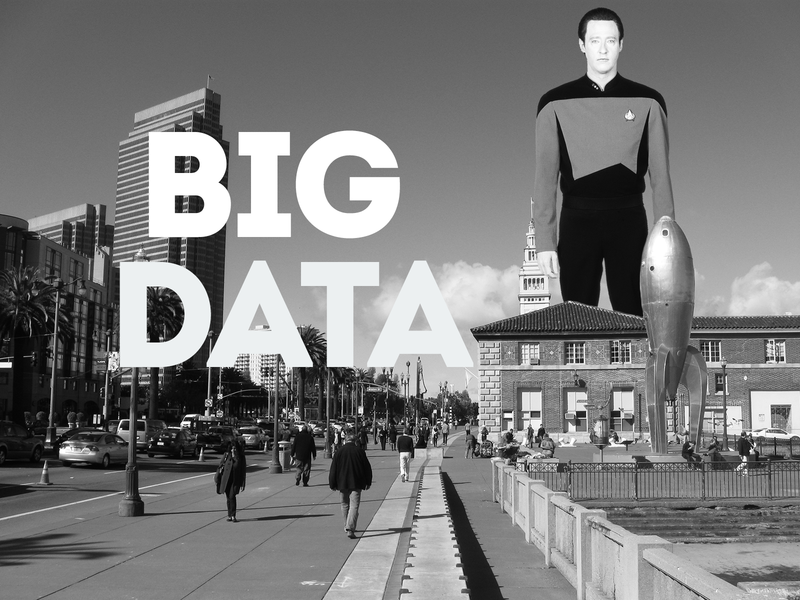 What I want to do here is report on my use of small data to help me in my teaching. I don't have any big data, and I don't want any big data. Instead, I design my classes so that I get the good, small data I need to help my students make sure they are making progress so that they can pass the course. That little snapshot of data tells me a lot! It tells me that right now, out of 90 students in the class, there are 9 students who are not passing, and that has been steady most of the semester, with around 7, 8, or 9 students in trouble in any given week. For me, that's important; I know there are always going to be students who are struggling in a class. If I were seeing a lot more students struggling, I would need to think about some major class redesign, but at this level, I am more focused on working with the individual students rather than some larger course redesign effort. Something else you can see there is that the cohort of struggling students has changed over the semester. There is one group of students who have been struggling from the very start, another set of students who have just recently fallen behind, along with a set of students who found a good routine for the class and are no longer in trouble. 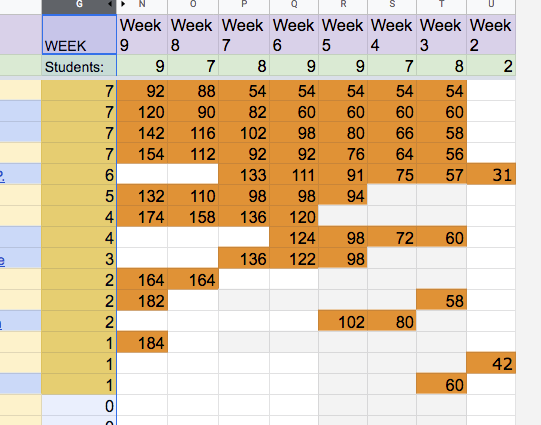 That's what I learn from sorting on the number of weeks students have been in the danger zone. Each week I communicate with the students who are currently in danger of not passing the class, but how I do that varies from student to student. 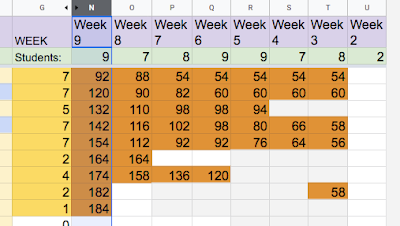 I can eyeball the chart to see if they made good progress from the previous week, and if so I can send them an email of encouragement to keep on doing more of the same. By this point in the semester, I also know each student's story, so I can also take that into account when I write to them (e.g., overwhelmed by school, by work, by health problems, by life problems; every student has their own story). 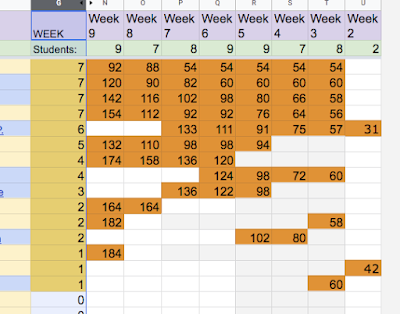 I have other columns in the spreadsheet that make it easy to get a fuller understanding of what is going on with each student because I have links to their class blog, their course project, along with their email addresses (I cannot stand the Canvas Messaging system and never use it unless I have to; that is also a subject for a separate post). By contrast, the Canvas Gradebook is useless to me, so in another post I will chronicle in more detail the failure of Canvas to help me track the data I need, along with the uselessness of the data that Canvas provides me with instead. Sure, Canvas has data about my students (all those clicks! all those eyeballs! ), but the data that Canvas collects is meaningless because it understands absolutely nothing about my course design. Not to mention that it knows nothing about my students and their stories. But more on that later. 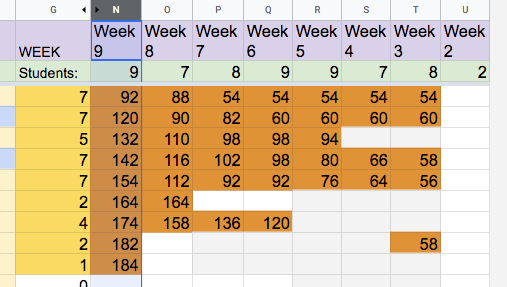 For now, I just wanted to sing the praises of small data and how it makes it possible for me to keep up with my 90 students and their progress at a cost of just 10 minutes or so of my time each week.